Fort Craig (1) (1854-1885) - Established 31 Mar 1854 by Captain Daniel T. Chandler, 3rd U.S. Infantry and one company, 2nd U.S. Dragoons, one company, 3rd U.S. Infantry, after Fort Conrad (1) was abandoned. Named after Captain Louis S. Craig, 3rd U.S. Infantry, who was killed 6 Jun 1852. Abandoned in 1885. Fort Craig was a large western style fort initially established in 1854 to house two companies of troops. 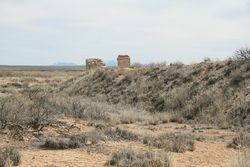 The fort had more than 22 buildings built of stone and adobe surrounded by an adobe wall with a dry ditch around the perimeter. The U.S. Civil War changed the configuration of the Fort by adding significant earthworks in and around the fort. The internal earthworks protected critical buildings and munitions. Among the significant substantial buildings were the commanding officer's quarters, the guard house and the magazine. The quartermaster's commissary and warehouse were protected by large earthworks. As a two company fort, the post was designed to house about 120 men and support personnel but in pre-U.S. Civil War days the post often had four companies and during the U.S. Civil War the population exceeded 4000 troops. The post was not nearly large enough to accommodate 4000 men so many were camped outside the walls. Fort Craig remained in Union hands after the start of the U.S. Civil War and by February 1862 had been reinforced with about 4000 regular and militia troops who were under the command of Colonel Edward R.S. Canby and supplemented by Colonel Kit Carson's 1st New Mexico Cavalry. This force was assembled because a Confederate force of 2600 under Brigadier General Henry Hopkins Sibley was advancing toward Fort Craig. On 21 Feb 1862, the two forces met at the Battle of Valverde just below Fort Craig at the base of Black Mesa. A sharp battle ensued with the Union forces withdrawing to Fort Craig and the Confederate forces bypassing the Fort and marching on toward Santa Fe. Much of the Confederate supply train was lost in the battle of Valverde and a subsequent battle, this loss of supplies eventually forced the Confederates to retreat back to Texas where they had started from. Fort Craig is listed as having housed Confederate prisoners of war in 1861-62 but the numbers are unknown. Fort Craig continued to be garrisoned after U.S. Civil War to control Indian depredations. By the 1880s the Fort was no longer necessary and it was permanently abandoned in 1885. 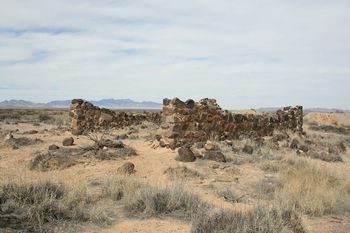 The Fort property was donated to the Bureau of Land Management by its private owners and is now listed on the National Register of Historic Places. Fort Craig is best accessed from Exit 115 on IH25 and by following NM 1 North from that exit to Fort Craig Road, the fort is about 4.5 miles down Fort Craig Road. Fort Craig Road is a well maintained gravel road. No period guns or mounts in place. 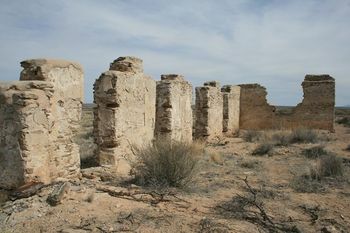 Location: Fort Craig National Historic Site, Socorro County, New Mexico. This page was last modified 10:14, 16 April 2019 by John Stanton. Based on work by Bill Thayer.